I watched in awe with my kids when a contestant on Junior Masterchef sliced into a perfectly cooked Beef Wellington – a dish I have cooked a number of times in the past, with varied results. Perhaps more disconcerting than a nine-year-old turning out my nemesis dish without raising a sweat was the fact that my own children started to expect dishes such as Chocolate Croissant Baked Pudding every night. Humph, it’s time to get back to basics. Before the term ‘celebrity chef’ was even coined there was Stephanie Alexander – a brilliant chef whose ‘celebrity’ status was earned through years of hard work in the kitchen and beyond. In 2004, she established the Stephanie Alexander Kitchen Garden Foundation, a program that engages and educates young children in growing, harvesting, preparing and sharing delicious, fresh, seasonal food. The newly released DVD, Real Kids, Real Food with Stephanie Alexander delivers exactly what the title promises. Although the emphasis is on demonstrating a number of simple, seasonal meals the film includes vignettes of kids gardening, picking vegetables, setting the table and serving the food – important in demonstrating the realistic ‘paddock to plate’ process that is often left out of cookery books for children. I like Alexander’s starting point – “You don’t need to be worried about mess… Otherwise you won’t make good pasta!” And with that, the kids throw a good handful of flour onto the bench and begin making fresh fettuccine with a simple tomato and fresh herb sauce. There’s also gnocchi, scrumptious looking broccoli and cauliflower fritters, spicy meatballs, green salad and barbecued vegetables. The kids do most of the work with Alexander lending a guiding hand and providing useful tips on the side. I like the relaxed, natural format – the kids are completely absorbed in what they are doing and the viewers are just looking in – there is no pandering to the audience or clever camera angles. 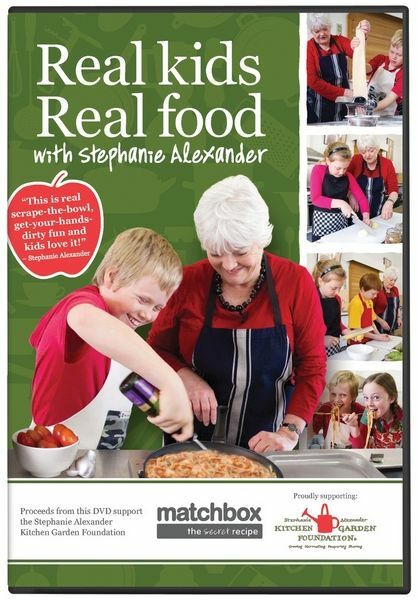 Buy the DVD including recipe booklet online from Matchbox or the Kitchen Garden Foundation for $19.95 including post. It is also available exclusively from Matchbox’s bricks and mortar stores for $14.95 with any purchase.